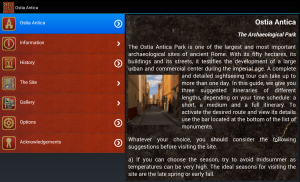 The archaeological park of Ostia Antica is one of the largest and most important archaeological sites of ancient Rome. With its fifty hectares, its buildings and its streets, it testifies the development of a large urban and commercial center during the imperial age. At the pinnacle of its evolution, Ostia was a crowded port with a population of more than 50.000 people, cosmopolitan, busy, full of shops, markets, inns, hotels and thirteen thermal baths, but also many temples dedicated to oriental cults, a well-equipped and rich town for sailors, travelers and merchants. 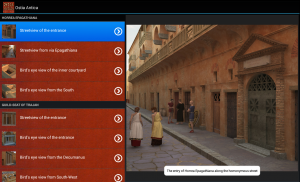 Simply put, Ostia was the most important port of the antiquity, the gate of Rome on the mediterranean sea.Ostia Antica for Android is a 3D Virtual Guide of this amazing site that has been conceived to bring you back in Time and offers you a complete reconstruction of the ancient town. 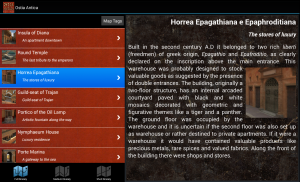 This application can be used, on Android devices, as a virtual guide during your on-site visit to enhance your knowledge on the urban layout, to understand the relationships between the buildings and to discover the culture, the organization and the rites of this unique Roman town.